Xiaomi Mi 3 comes in a pretty much standard box, made out of recycled paper. Inside we find a basic set of accessories - a microUSB, a 1A wall plug and a SIM ejector pin. Xiaomi Mi 3 spreads at 144 x 73.6 x 8.1 mm and weighs about 145g. This is exactly the same footprint as Sony Xperia Z1's, but lighter. Unfortunately this means the Xiaomi Mi 3 also has rather big screen bezels. The Xiaomi Mi 3 features a stylish polycarbonate chassis that wraps around the sides of the device a lot like some Nokia Lumia phone do. While this makes the 3050mAh battery inaccessible, the rounded edges mean the device is a pleasure to hold. We've always liked Nokia's choice of materials for its top Lumia models and we are glad to see the polycarbonate working out for another brand. The rear side finish promises no nasty fingerprint smudges. The pitch black front contributes to the overall classy feeling and is very easy to clean. You can barely see where the IPS display ends and the frame begins. Xiaomi Mi 3 was designed to look and feel like the flagship device it is. You will easily pick it up when put in whatever lineup of devices no matter it doesn't bet on any iconic elements as some of its competitors. It is likeable and beautiful, thoughtfully designed with usability and style in mind. Handling the Xiaomi Mi 3 is as pleasurable as it can get - the polycarbonate unibody is solid and provides great grip thanks to its matte surface. 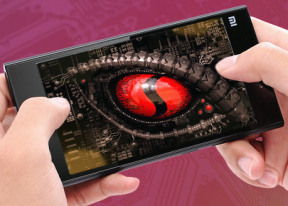 The Mi 3 is just 8mm thin, but its wide footprint doesn't allow you to forget it's in your pocket. The Xiaomi Mi 3 features a 5" Full HD IPS display with a pixel density of 441ppi, which places it among the best in-class. It's covered by Gorilla Glass 3 for protection against scratches and cracks from pressure. Here is the display matrix of the Xiaomi Mi 3 shot from upclose. 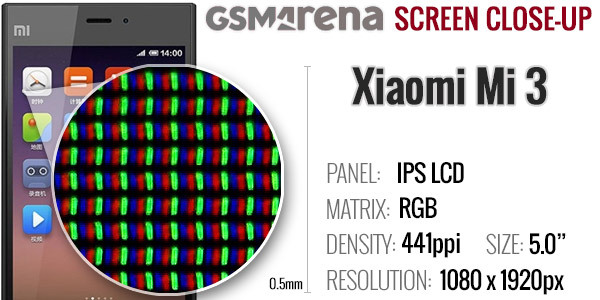 Taking a closer look at it under our digital microscope reveals a standard RGB arrangement of the sub-pixels that make up the Xiaomi Mi 3 LCD panel, not that we've expected anything else. The display on the Xiaomi Mi 3 is bright enough at 100% with good contrast and colors. Unfortunately dropping the brightness reduces the contrast and the screen becomes dim very soon, which makes us believe 50% of the brightness scrubber is way below 50% of the actual brightness. Unfortunately, the brightness of the screen is uneven with the backlight source being pretty visible at the top of the screen. When you have a white page opened on the screen you can easily notice the gradual brightness falloff from top to bottom. On the positive side, that's only visible with a full-on white or gray screen - in any other case it's as good as invisible. The sunlight legibility isn't great, but the Xiaomi Mi 3's display is still usable outside and you will be able to see what's happening on the screen. Xiaomi is providing options for color temperature and saturation. Glove mode is available too, but you probably shouldn't leave that turned on if you don't need it because it may drain your battery faster. Finally there is an option to prevent accidental unlocks of your screen, while the phone is in your pocket. If enabled, you won't be able to unlock the scren while something is covering the proximity sensor. Again, that would take its toll on the battery life.